Clarke, O Cearuill, Harris, Paisley, Partridge, Kirby (Dempsey 77), Fahey, Lynch, O?Neill (Fitzpatrick 90+2), Quigley, Ryan (Guy 81). Rogers, Nooitmeer, McCulloch (O'Shea 70), Charles (Faherty 46), Fitzgerald, Lester, Leech, O'Brien, Fenn, Deegan, Russell. St Patrick's Athletic maintained their 100% start to the league campaign with a 1-0 victory over Galway United at Richmond Park, writes Mark Cummins. Mark Quigley netted the all-important goal against the run of play on 22 minutes. United dominated for long periods and were very unlucky not to come away from the game with at least a point. They finished with 10 men, however, after John Fitzgerald was dismissed for two yellow cards on 68. Galway looked the better side early on with Oliver Fenn shooting a low drive from the right on five minutes, but Brendan Clarke made a decent save. Pat's' first effort on goal came on nine minutes when Stephen Paisley swung in a cross from the right for Mark Quigley but Galway keeper Gary Rogers collected at his near post. The in-form Keith Fahey struck a great dipping free kick for Pat's on nine minutes, but Rogers was well placed and comfortably saved. 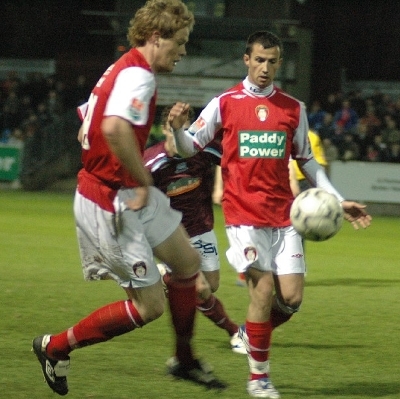 Pat's took the lead on 22 minutes when Gary O'Neill beat Wesley Charles and set up Quigley who powered home from close range. Galway nearly drew level on the half hour when Charles collected a cross from Russell but the big man sent his powerful header inches wide. Galway went 4-4-2 for the second half and continued to have the best of the play with Pat's rarely getting a look in. But on the hour mark Bobby Ryan should have netted number two for the Saints, but blasted his shot high and wide over the Kilmainham end goal. Galway were reduced to 10 men on 68 when Fitzgerald was given a second yellow card for pulling back Quigley who was dashing in on goal.